Confused about True Bypass and why you may want it? 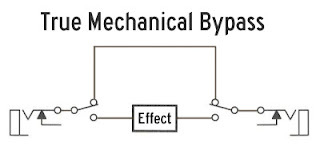 Mechanical bypass is a method of physically switching the signal. 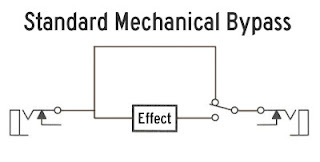 Above is a diagram showing a common method of bypass switching found in older Electro Harmonix pedals, wahs, and various other pedals. The signal is always connected to the input of the effect’s circuitry which loads down the signal. This can cause added noise, decreased volume, and a loss of brightness. The diagram above disproves the common misnomer that only true bypass pedals will pass a signal when the battery power is disconnected. This circuit will pass the uneffected signal even if a battery is not installed. True bypass switches both the input and output of the effect’s circuitry. The signal should go from the input jack, to the switch, to the output jack without any other components in the signal path. This is the purest form of bypass and is essentially has the same impact on your tone as running a small patch cable. The effect’s circuitry is completely isolated from your signal path when bypassed. 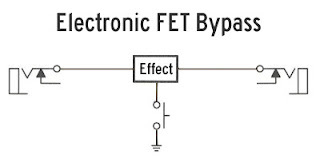 Electronic bypass comes in a few forms but using transistors such as FETs is the most commonly used method. This is popular with Boss, DOD, Ibanez, Danelectro, Digitech, and many other manufacturers. The signal is always flowing through some form of active circuitry (referred to as a buffer) and uses transistors to switch the effect in and out of the signal path. If you remove the battery power the signal will not pass through the pedal. Check out the True Bypass link on FXdoctor Website if interested in having this work performed on your pedals. This entry was posted in Favorites, Gear Related and tagged True Bypass. Bookmark the permalink.